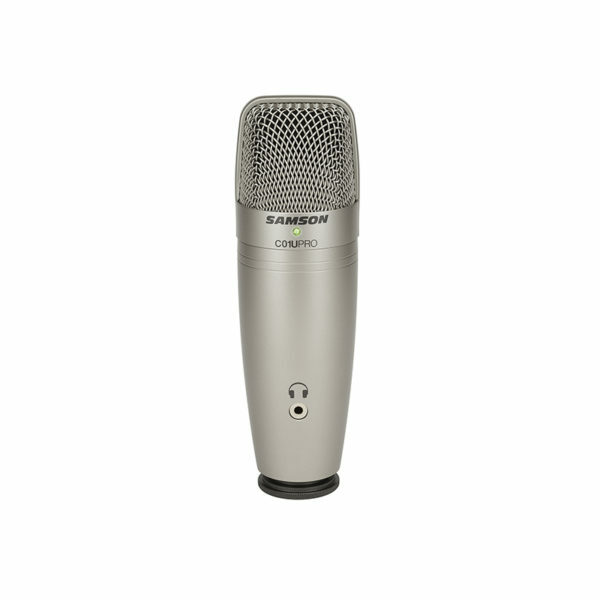 In 2005, Samson introduced the world’s first USB studio condenser microphone, the C01U. Today, we’re expanding on its revolutionary design with the new C01U Pro. Now with a headphone output for zero-latency monitoring and an improved signal-to-noise ratio, the C01U Pro ensures the natural warmth and detail of vocal and instrumental performances are captured in all your digital recordings. Capturing audio at a 16-bit 44.1/48 kHz resolution with a smooth, flat frequency response of 20Hz–18kHz, the C01U Pro ensures the authentic projection of both high and low frequencies to your favorite DAW or recording app. In addition, Samson maintains its longstanding commitment to user convenience with plug-and-play operation (no driver installation necessary), USB power via Mac, PC or iPad (cable included), as well as an included tripod stand and swivel mount for optimal desktop placement. CO1U Pro is even compatible with iPads and iPhones (4S and later) using Apple’s Lightning USB Camera Adapter or Camera Connection Kit (30-pin) for those seeking to achieve pro-level sound on-the-go.